Luna moths are members of the silk moth family, Saturniidae, which includes the largest moths in North America. Because of their unusual coloring, large size and ease of care, these green moths commonly serve as insect pets in the classroom. Raising luna moths isn't a difficult process; you just need to meet certain care requirements. 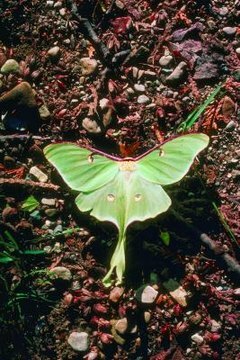 Luna moths are among the largest in North America, with wingspans sometimes reaching beyond 4 inches. Adults are pale green and marked with pinkish-purple and yellow. Their hind wings are long and twisted, adding to the moths' aesthetic appeal. Caterpillars are light green to bright green with yellow stripes; they display dark, reddish-orange tubercles on each body segment. At maturity, these large caterpillars can reach nearly 3 inches long and have thick bodies. Female luna moths deposit their eggs on appropriate food sources, which vary from region to region. Host plants include white birch, trees in the walnut family, hickory, sweetgum and persimmon. The University of Florida Entomology and Nematology website recommends sweetgum for captive rearing. To rear the eggs, carefully place them in a petri dish or a plastic food container. The eggs are covered with a brown adhesive substance that secures them to the surface the female deposited them on. Carefully remove them from the leaf, as the leaf will wilt in the container. Hatchlings begin emerging in approximately 10 days. As you begin noticing hatchlings, collect fresh leaves from one of the luna's host plants and place them in your awaiting aquarium. Another option is a healthy branch from a host plant. Keep track of how many hatchlings there are so you can be sure you get them all into the aquarium. Hatchlings are less than a quarter-inch long and may be hard to see. Transfer the larvae into the aquarium using a paintbrush by placing it in front of them and gently brushing it over them or by using your finger to encourage them to crawl onto the bristles. Another option is to place a paper towel in front of the wriggling larvae and let them crawl onto it, then place it into the aquarium and allow them to crawl off. An aquarium with a tight-fitting screened lid can make the ideal habitat for your wriggling larvae once they emerge from their eggs. An aquarium allows you to place entire branches of food and offers ventilation while keeping your babies in check. An aquarium also serves as a suitable enclosure for the caterpillars to pupate. The aquarium doesn't need to be fancy; simply a branch of their favorite food with the cut stuck in a water container. Change the food supply at least once a day and clean out the water dish the plant's stem is in. Clean up the frass, caterpillar poo, twice per day. As your caterpillars begin growing larger and going through instars, you may need to separate them into different containers to prevent overcrowding. Once your caterpillars begin to slow down on the all-you-can-eat buffet, they'll begin turning a deeper red color and start spinning the cocoons in which they'll pupate. Place a branch with enough leaves for each larvae; luna moths typically wrap their cocoons up in leaves. During the pupal stage, keep the aquarium moist by placing a wet sponge on the bottom and covering most of the screened lid with a piece of plastic. You'll also need to keep the enclosure moist for the emerging adults. Adults don't feed; release them so they can fulfill their one mission: mating.